Commencement speaker Margot Lee Shetterly, center, author of the bestselling book Hidden Figures, with WPI President Laurie Leshin and board chairman Jack T. Mollen. 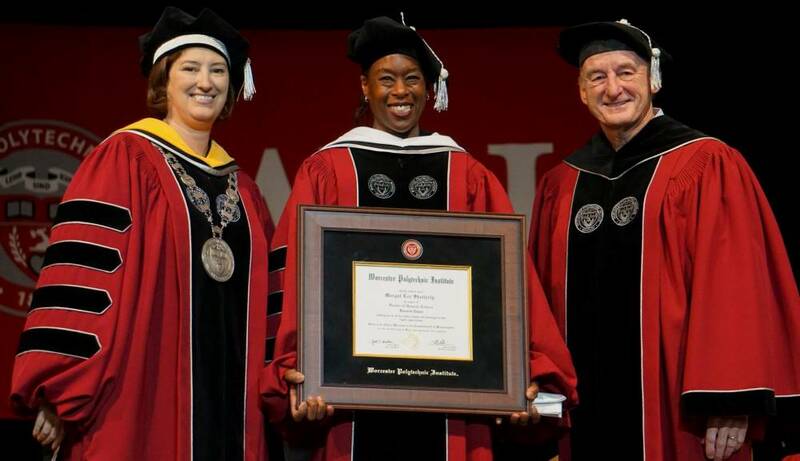 During the ceremony, Shetterly received an honorary doctorate in humane letters. Today, as part of its 150th Commencement exercises, Worcester Polytechnic Institute honored the 981 members of the undergraduate Class of 2018 in a ceremony held on the campus quadrangle under a white tent that shielded guests from the light rain. Nearly 830 master’s and doctoral degrees were bestowed in a separate ceremony on Thursday evening. President Laurie Leshin and Board of Trustees Chairman Jack Mollen presided over today's celebration, at which the keynote address was given by Margot Lee Shetterly, author of Hidden Figures: The American Dream and the Untold Story of the Black Women Mathematicians Who Helped Win the Space Race. The book, which was made into a major motion picture in 2016, shares the history of the black female mathematicians who were part of NASA’s workforce from the 1940s to the 1960s. Shetterly, who is also the founder of The Human Computer Project, received an honorary doctor of humane letters degree. By way of example, Shetterly talked about Henry J.E. Reid, WPI Class of 1919, who was director of the Langley Memorial Aeronautical Laboratory, where Hidden Figures is set, from 1926 to 1961. The lab was then part of the National Advisory Committee for Aeronautics (NACA), precursor to the National Aeronautics and Space Administration (NASA). Shetterly noted that the lab was also where Richard Whitcomb, WPI Class of 1943, conducted his groundbreaking research that made supersonic flight practical. from dean of undergraduate studies Arthur Heinricher. Reid oversaw the laboratory at a time when aeronautical research mathematicians—or human “computers,” as they were called—were critical to the mission’s success. It was also a time of desegregation and racial tension, when blacks were still commonly denied equal rights and access to jobs. While not a civil rights activist, Shetterly said, Reid was a practical man focused on the goals of his laboratory and mission. In her remarks, President Leshin , reminded members of the Class of 2018 that she herself had arrived on campus when they did, having begun her presidency just a few weeks before their move-in day in 2014.
ago, when they crossed the Earle Bridge together. “Your first week on campus, you offered me the privilege of joining you in one of WPI’s most hallowed traditions, crossing Earle Bridge. Since then, you and I have experienced WPI together. I watched you win your first rope pull competition… and you cheered me on while a robot poured freezing cold water on me for the ALS Ice Bucket Challenge. We all learned WPI’s special language of acronyms. “But most importantly, we discovered together the life-altering privilege of being part of a university that challenges us to do our best every single day,” she said. “Fast forward to today. This morning, I had the honor of watching you again cross Earle Bridge, this time without me.” WPI tradition holds that the incoming class crosses Earle Bridge to begin their studies here, while the graduating class crosses the bridge—in the opposite direction—signaling the conclusion of their time as WPI students. President Leshin described three students who have made their dreams a reality at WPI: Kelly Carlson, of Arizona, who, as a child, marveled at the attractions at Disneyland and thought, “Wow, somebody made this!” Carlson wrote to Disney, Leshin said, and asked how she could “become that someone, and Disney wrote back: ‘Study mechanical engineering.’” So she did. Carlson, who received a full scholarship to WPI (the Paul Allaire/ FIRST Robotics Future Engineering Leadership Scholarship), earned her degree and landed her dream job as a show mechanical and animation engineer for Walt Disney Imagineering. Leshin also talked about Ama Biney, who grew up in Worcester, “right next door to WPI. At 18, Ama was already known throughout our home city as a superstar athlete, and she came to WPI to find out how else she could make an impact.” Biney earned her degree in management engineering, while also competing on the varsity basketball and softball teams, earning numerous league and national awards for both academic and athletic performance, including being named this year’s NEWMAC Athlete of the Year in both basketball and softball. “I attended many of Ama’s games and always feel great pride in the way that she, and all of our student-athletes, represent WPI,” said Leshin. Biney has taken a position at United Technologies, in Palm Beach, Florida, where she will participate in the company’s premier Operations Leadership Program. Lastly, Leshin called out David D’Antonio, whose story “shows a special amount of perseverance.” In 1980, D’Antonio dropped out of WPI when could no longer afford to attend. He had been a computer science major and over his career worked as a software engineer for companies such as then Digital Equipment Corp., Car Gurus and ZipCar. During the ceremony, Shetterly received an honorary doctor of humane letters degree, and Philip Ryan ‘65, former chairman of the Board of Trustees who served as interim president of WPI in 2013-14, received an honorary doctor of engineering degree. Ryan earned his bachelor’s degree in civil engineering at WPI and an MBA from Harvard Business School and became a highly successful management consultant with a long career of helping corporations and individuals achieve their best performance. Throughout his life, he remained close to WPI and set a high standard as an alumni volunteer, serving on countless committees, and was ultimately elected to WPI’s board in 1999. In 2013, he was asked to serve as interim president as the university moved forward with a major fundraising campaign, celebrated its 150th anniversary, and chose its 16th president, Laurie Leshin. He was board chair for President Leshin’s first two years and continues to serve as an emeritus trustee. others. Challenge your views. Advance your world." Since 2016, WPI has held two distinct exercises in the spring to celebrate the accomplishments of its undergraduate and graduate students, owing in part to the growth of its programs, particularly its graduate programs. 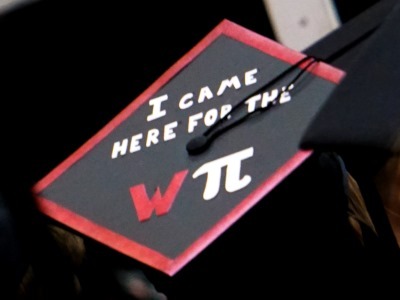 This year WPI awarded a total of 764 master’s degrees and 65 PhDs, including its first PhD from the Foisie Business School, Thursday evening in a Graduate Commencement ceremony at which Marcia McNutt, president of the National Academy of Science, gave the keynote. McNutt and Glenn Yee, ’74, trustee emeritus and founder of Pacific Can Company, received honorary degrees. On Friday, 25 cadets of the Army, Navy, and Air Force ROTC were commissioned as officers in the U.S. military during the Worcester Consortium of Colleges Reserve Officers’ Training (ROTC) Corps Joint Service Commissioning Ceremony. Robert Catalanotti, Senior Advisor to the Assistant Secretary of Defense for International Security Affairs and recently retired Major General, presided as commissioning officer, administering the oath of office and delivering the keynote remarks.